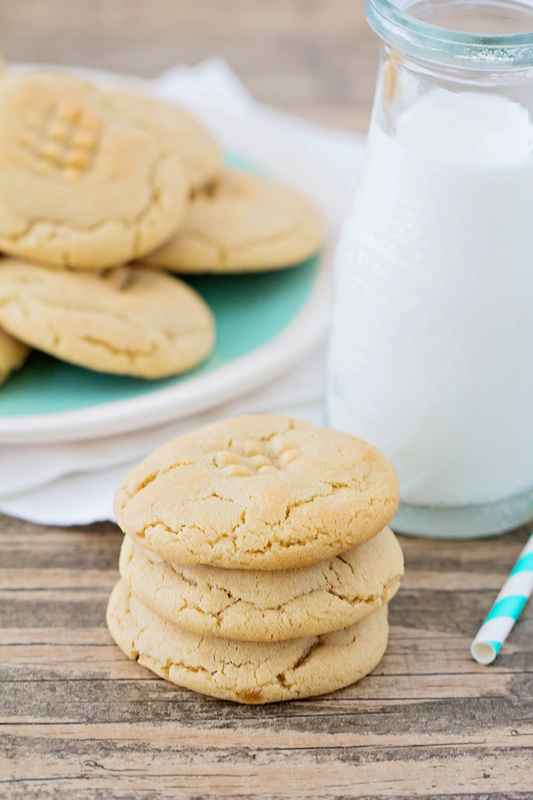 These caramel stuffed peanut butter cookies are so indulgent and delicious! Buttery, soft peanut butter cookies with a gooey caramel and chocolate center. Yum! This week, during a marathon cooking session, trying to catch up on some deadlines, I heard Georgia ask her cat Elvis if he wanted a cookie about five times during the same afternoon. And then it dawned on me that I wanted a cookie myself! 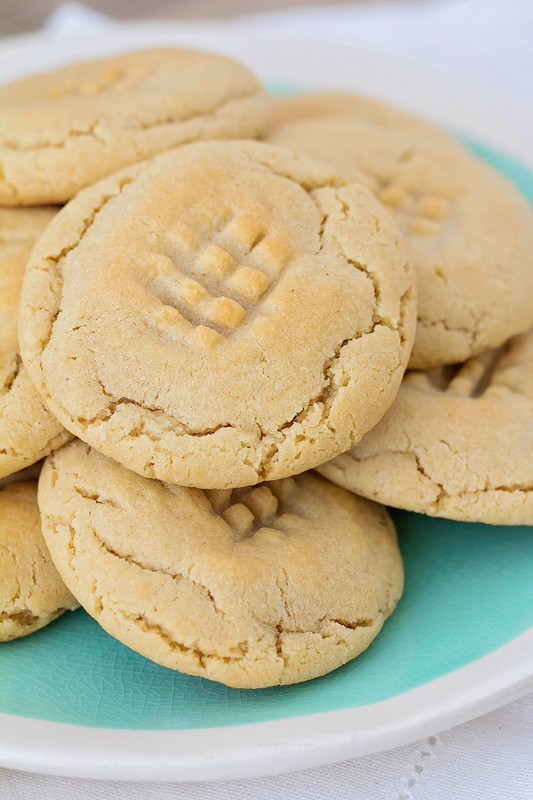 :) These caramel stuffed peanut butter cookies were the answer, and they are totally fabulous. 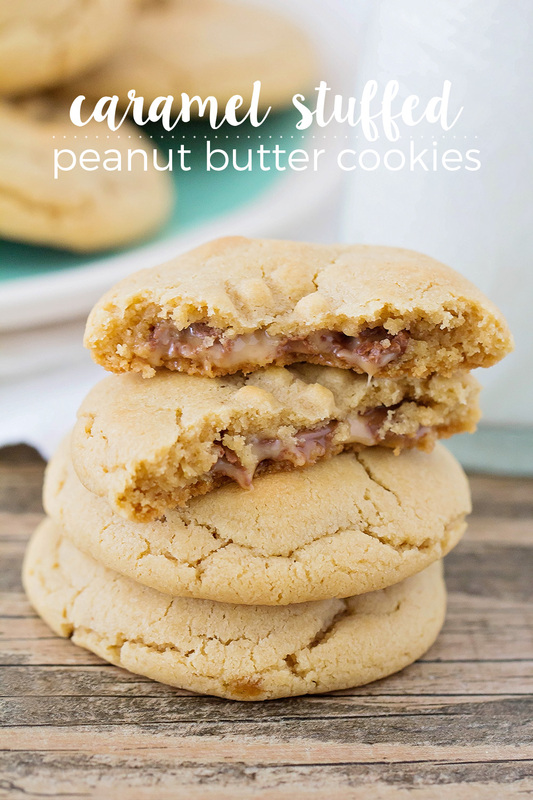 The dough is from my very favorite peanut butter cookies, and they're stuffed with Rolos candies, so each bite has a delicious mixture of peanut butter cookie, caramel, and chocolate. 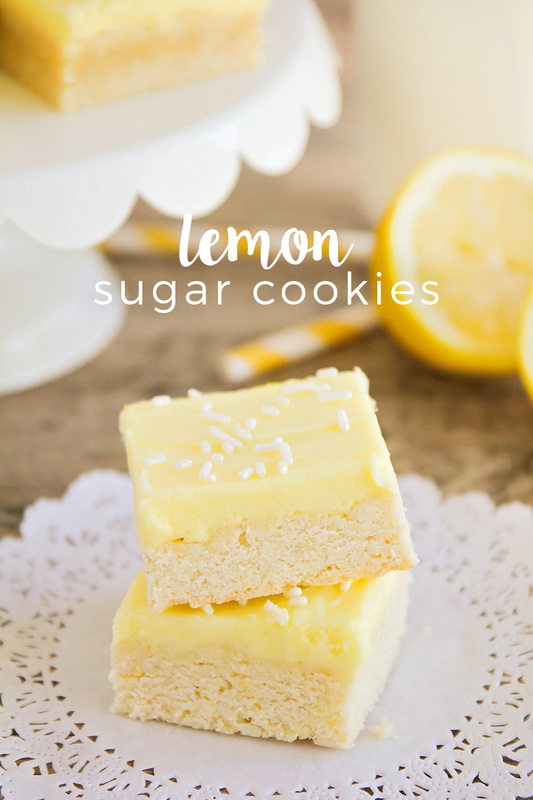 They're delicious, easy to make, and perfect for satisfying that cookie craving! Preheat the oven to 375. Line two baking sheets with silicone or parchment. In a large bowl or the bowl of a stand mixer, beat together the butter, sugar, brown sugar, and peanut butter, until smooth. Add the egg and vanilla and beat until smooth. Stir in the flour, baking soda, and salt, to form a thick dough. Scoop the dough into one inch balls. Flatten each ball of dough with your hand, place a Rolo in the center, and wrap the dough around the candy. Shape into a ball and place on the prepared baking sheet, leaving 2 inches in between to allow for spreading. Make a criss-cross on top of each ballwith a fork, being careful not to press down too hard. 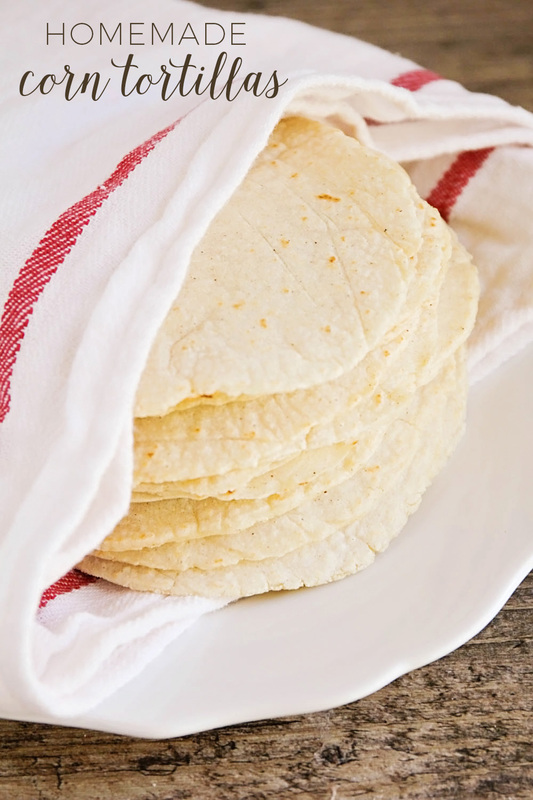 Bake 10-12 minutes, or until the bottoms are light golden brown. 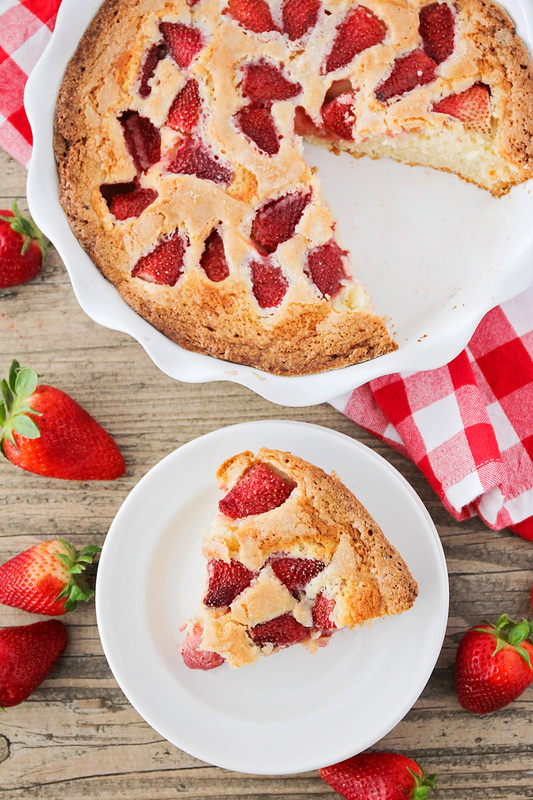 This tender and sweet strawberry summer cake is loaded with fresh strawberries, and so quick and easy to make! Fresh strawberries and cake are always a good combination, am I right? 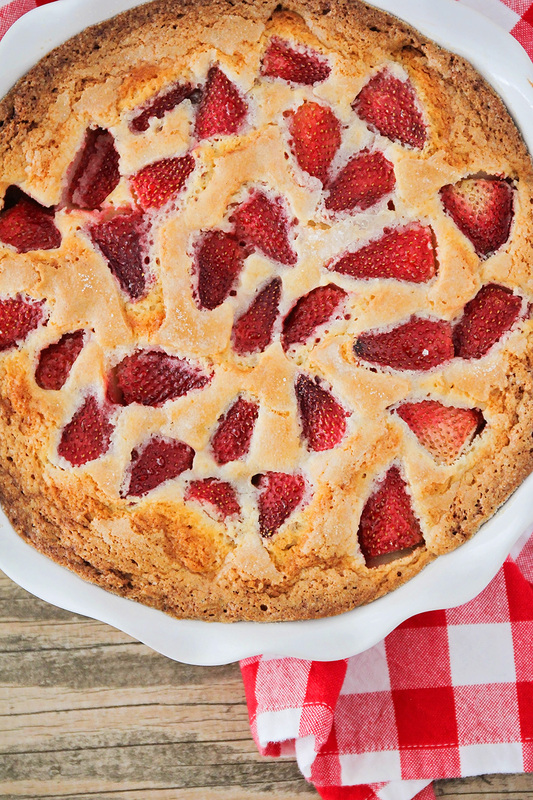 This strawberry summer cake has been a favorite at our house for years and years, and it's one of my go-to's when I need a simple dessert that tastes amazing. I always have the ingredients for the cake on hand, and it's easy to swap out whatever fresh seasonal fruit is available. I think it's my favorite with strawberries, though! 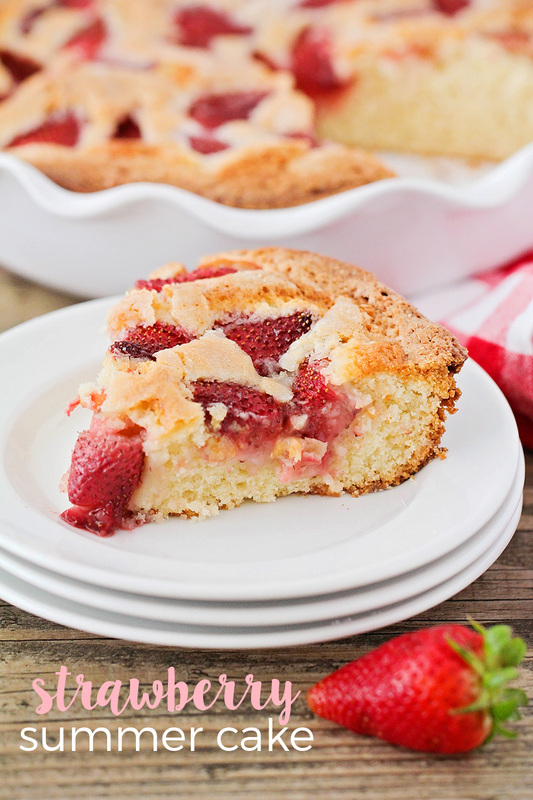 The cake is tender and buttery, and the strawberries turn into little puddles of jam as they bake. This cake never lasts long at our house, and for good reason! Preheat the oven to 350. Grease a 9 inch pie plate or 9 inch cake pan and set aside. 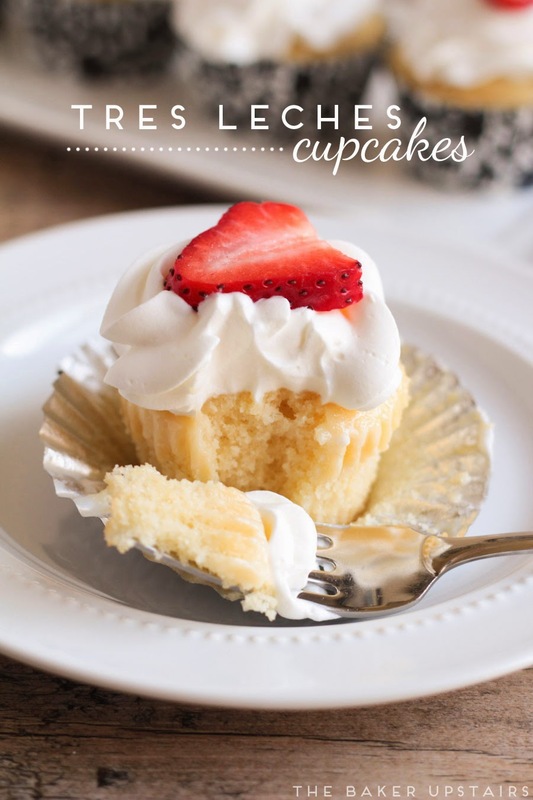 In a large bowl or the bowl of a stand mixer, beat together the butter and 1 cup sugar, until light and fluffy. Add the egg, milk, and vanilla, and beat until smooth. Add the flour, baking powder, and salt, and mix until just combined. Spread the cake batter in the prepared pie plate. Arrange the strawberries, cut side down, on top of the batter, spacing them close together (it's okay to overlap a little if you run out of room). Sprinkle with the remaining 1 tablespoon sugar. Bake then cake for 10 minutes, then reduce the heat to 325. Bake an additional 50-60 minutes, or until the cake is golden brown and a toothpick inserted into the cake comes out clean. 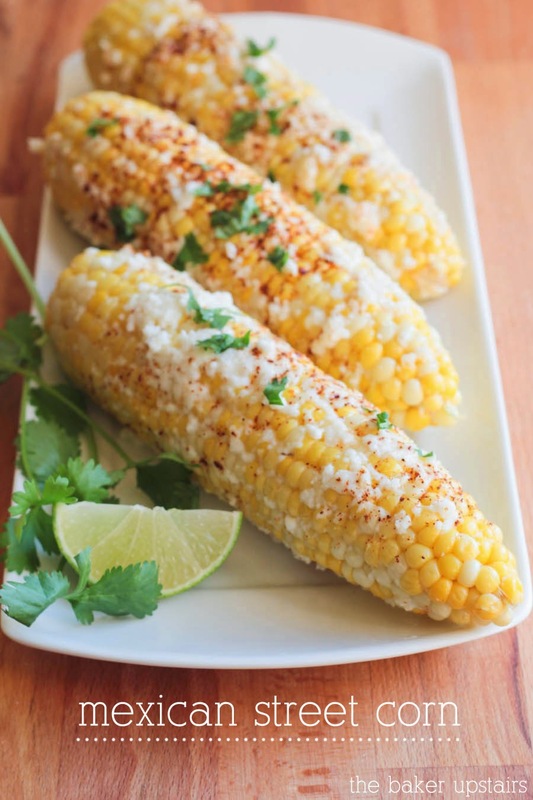 23 super delicious Cinco de Mayo recipes - everything you need to celebrate in the tastiest way possible! 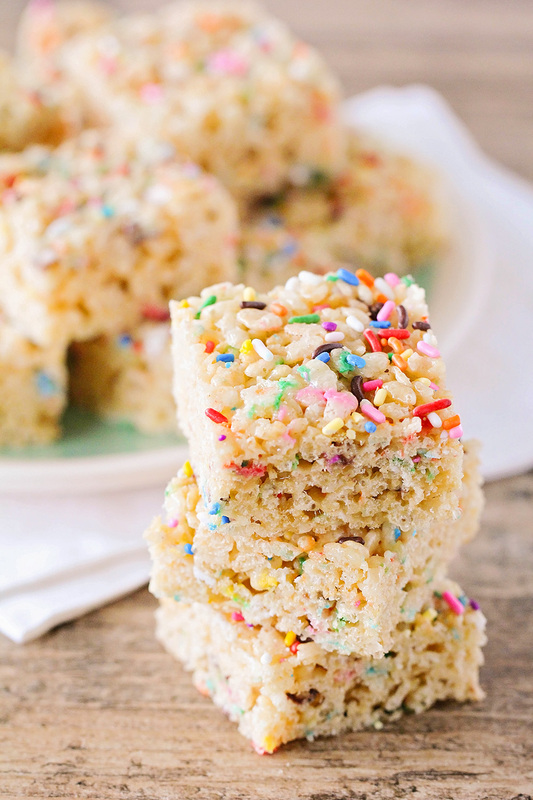 These cake batter rice krispy treats taste just like birthday cake and are loaded with colorful sprinkles. 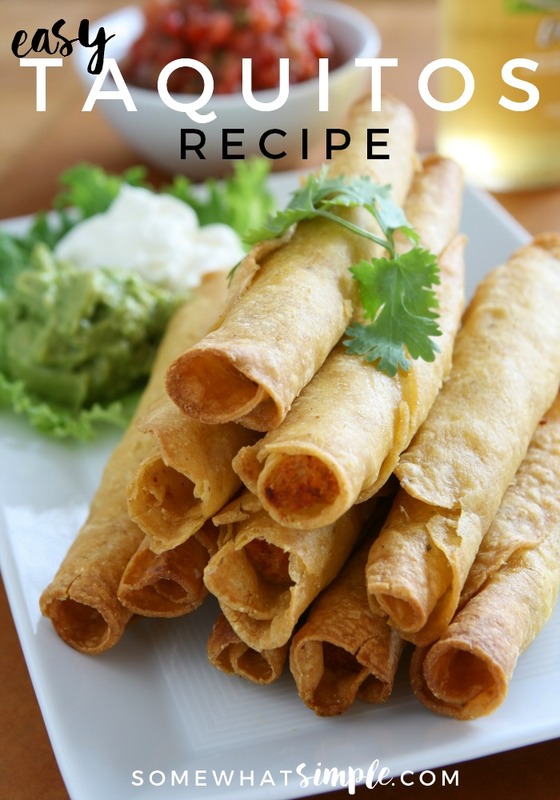 So easy to make and the kids will love them! When it comes to cake, I am definitely a from-scratch girl. I've tried all the tricks with store-bought cake mixes, and they never turn out well for me. I don't know how it's possible that I can't bake a cake from a mix to save my life, but I can bake a from-scratch cake with no problem, but here we are. Despite not being able to bake a cake from a mix, I still find myself buying cake mixes frequently, and using them in other recipes, just because I love the flavor! 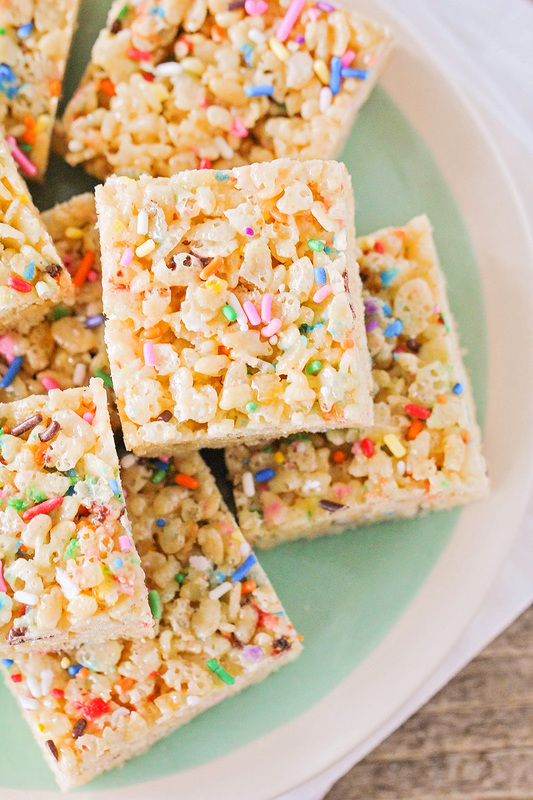 These cake batter rice krispy treats were exactly what I needed on a day when I was craving a good piece of cake, but way too lazy to actually bake anything. 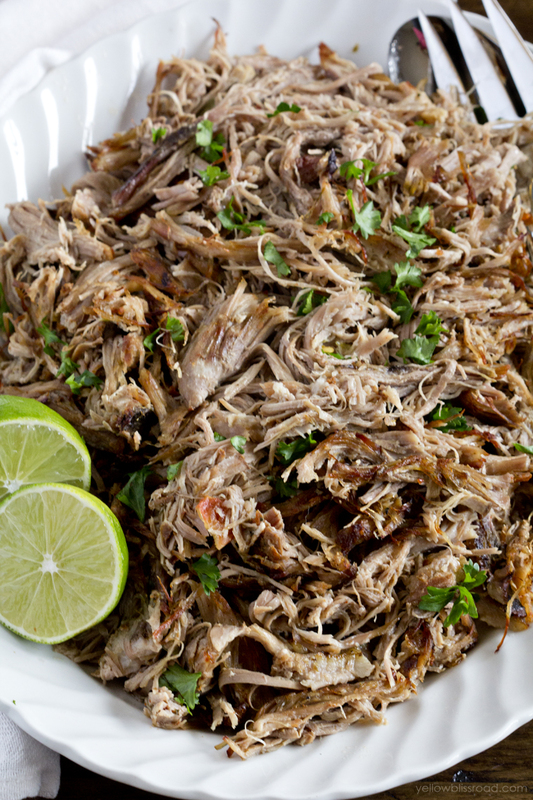 They take only a few minutes to whip up, and taste amazing! Anything with sprinkles tastes better, right? I love that these are such a simple and fun treat, and easy enough that the kids can help make them too. 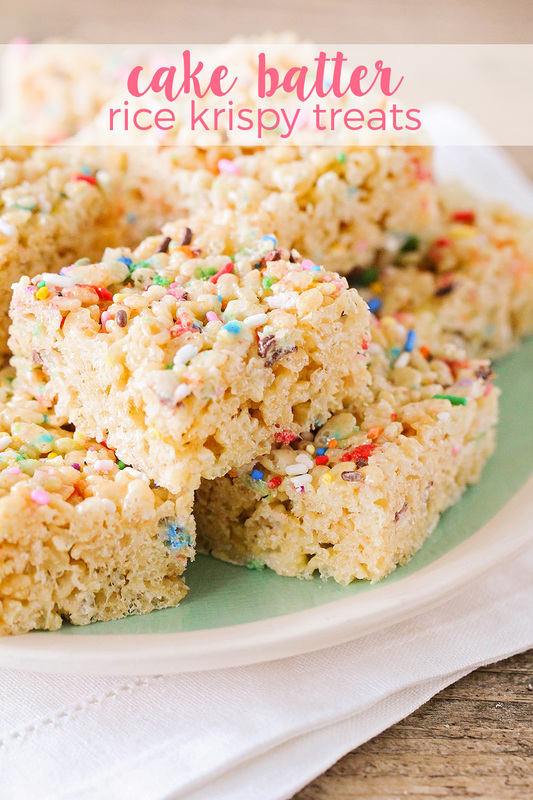 Rice krispy treats always have a special place in my heart, and these are some of my favorites that I've ever made! Spray a 9 x 13 pan with cooking spray or line with parchment. In a medium pot, melt the butter over medium heat. Add the marshmallows and stir until melted. Remove from heat and stir in the cake mix and vanilla. Gently stir in the cereal and half of the sprinkles. Spread the mixture in the prepared pan and top with remaining sprinkles. 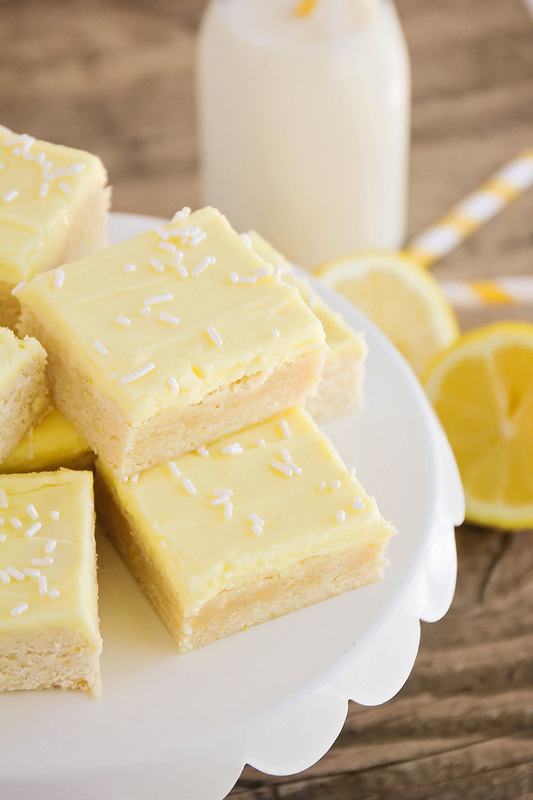 Let cool, then cut into squares and serve. 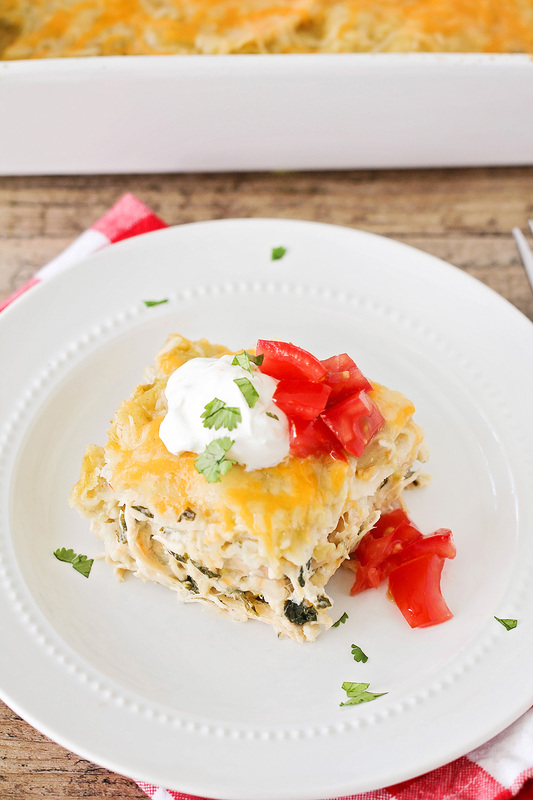 This creamy, cheesy, baked enchilada lasagna is so easy to make and so flavorful! 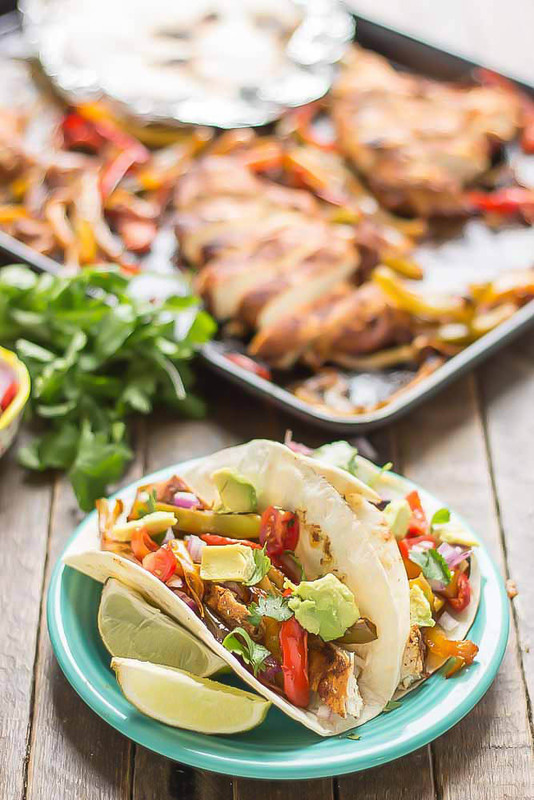 It's a hearty and delicious meal that everyone will love! 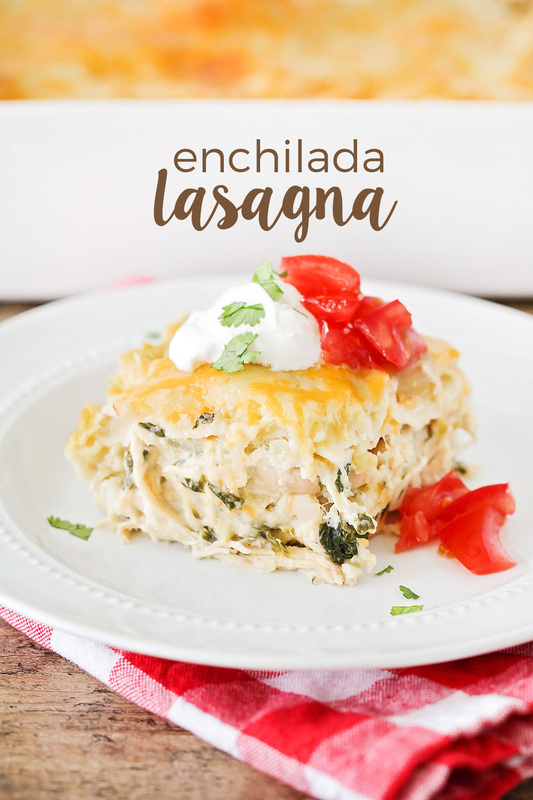 This enchilada lasagna is, hands down, one of my family's favorite meals! It has been a staple in our family for the last five years or so, and I make it so regularly that I'm pretty sure could make it in my sleep. 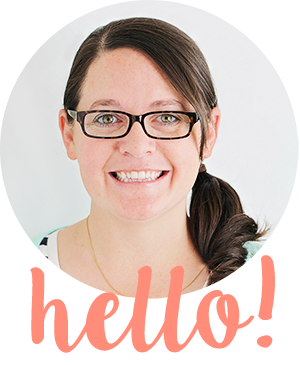 It was only recently that I realized I have never added the recipe to the blog, which is a total shame. 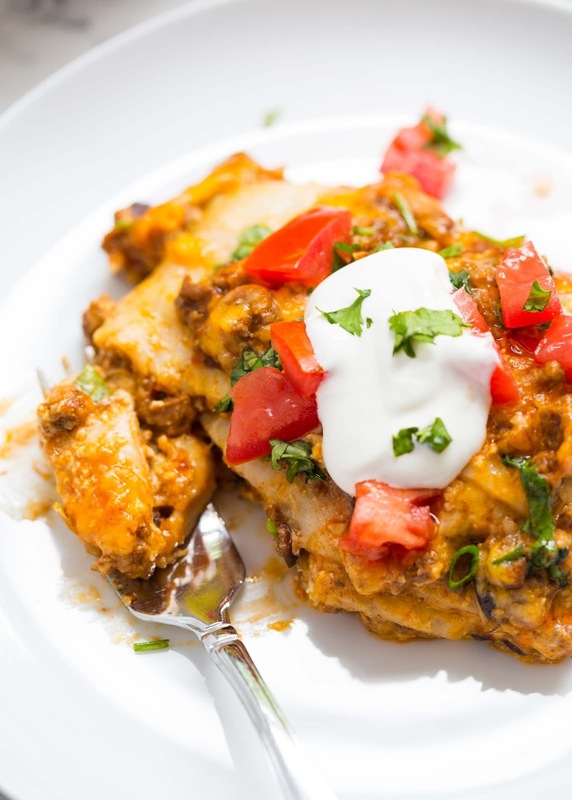 It's a great meal to make ahead, and also makes an awesome freezer meal! 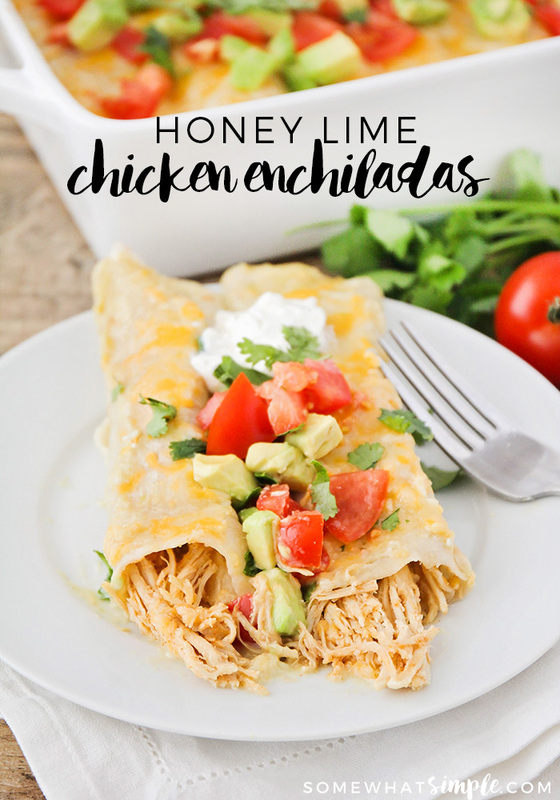 It's loaded with layers of soft corn tortillas, creamy chicken filling, and savory enchilada sauce, and so cheesy and delicious! 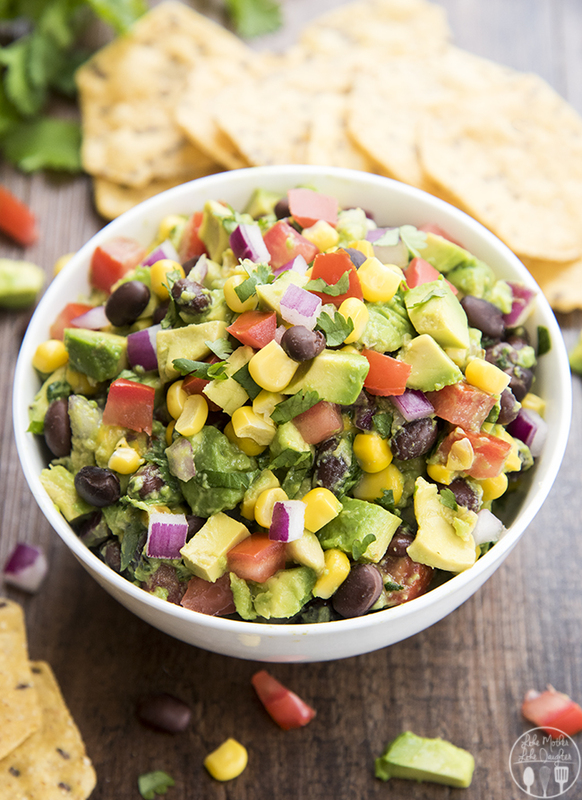 I like to add spinach and beans to the filling to add a little nutrition (and because it's the only way I can get my suddenly picky six year old to eat them), but you could easily swap out some other vegetables or just leave them out completely. 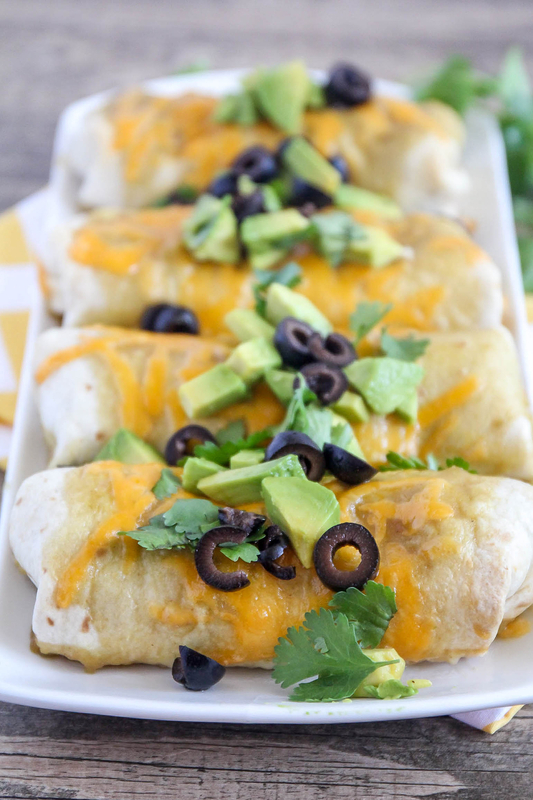 Either way, it's a tasty, filling, totally easy to make dinner that everyone will love! Preheat the oven to 350. Spray a 9 x 9 baking dish with cooking spray. 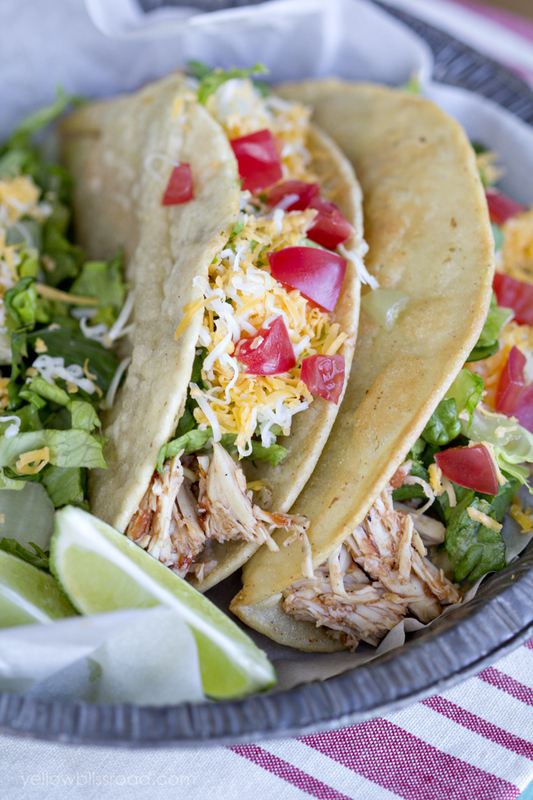 In a large bowl, mix together the chicken, cream cheese, spinach, beans, green chilies, and 2 cups of cheese. Stir in the garlic powder, salt, and pepper. In the bottom of the baking dish, spread about 1/2 cup of enchilada sauce to cover the bottom. Layer 4 tortillas on the bottom of the dish. Top with half of the chicken mixture. 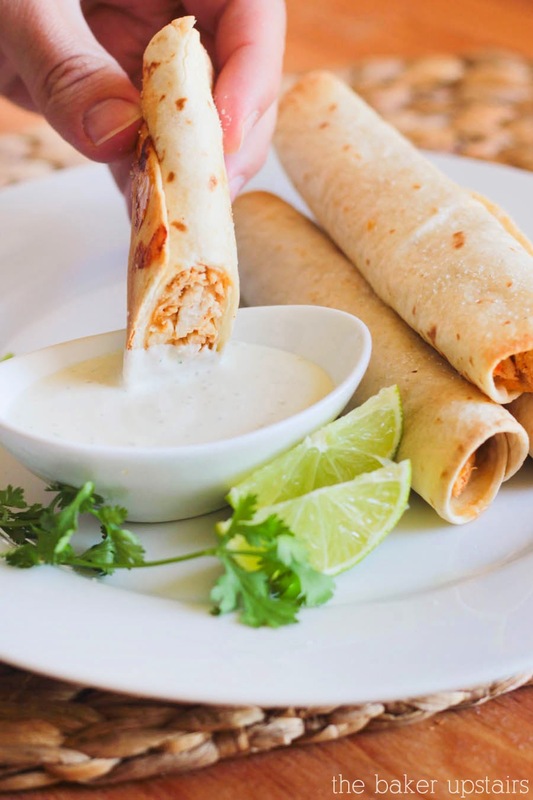 Layer another 4 tortillas over the top of the chicken mixture, then spread with half of the remaining enchilada sauce. Top with the remaining chicken mixture. Layer 4 more tortillas over the top of the chicken mixture, spread with the remaining enchilada sauce, and sprinkle with remaining 1 cup of cheese. Bake 30-35 minutes, or until the cheese is melted and the sauce is bubbling. Let stand ten minutes before serving. 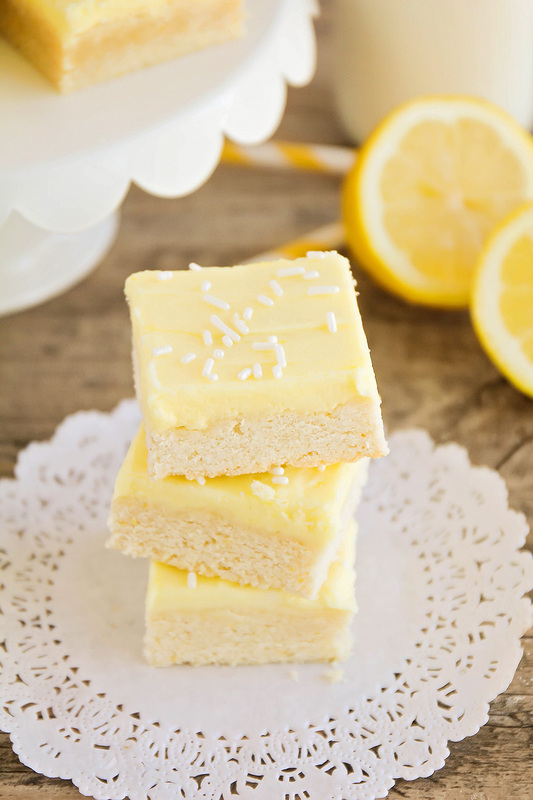 These sweet and tangy lemon sugar cookie bars are so delicious and easy to make. All the taste of sugar cookies without the annoying rolling and cutting! Preheat the oven to 375. Line a 9 x 13 pan with foil or parchment and set aside. In a large bowl or the bowl of a stand mixer, beat the butter and sugar until light and fluffy. Add the lemon zest and beat until fragrant. Add the egg, egg white, sour cream, vanilla, and lemon extract, and beat until smooth. Add the flour, baking powder, and salt, and mix to form a crumbly dough. 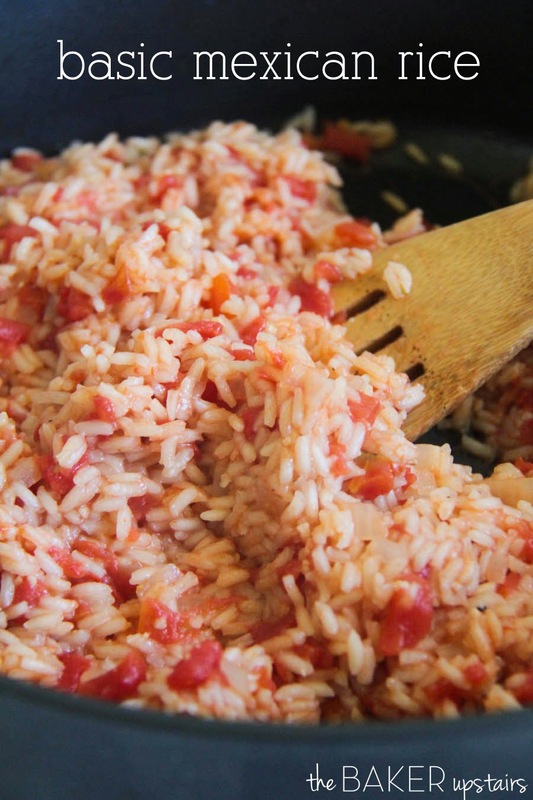 Press the dough into the bottom of the prepared pan in an even layer. Pierce the dough with a fork every few inches to prevent it from bubbling while baking. Bake 17-20 minutes, or until light golden around the edges. Remove from the oven and let cool completely. When the cookies have cooled, beat together the butter and powdered sugar. Add the lemon juice, milk, and vanilla, and beat until smooth. Add the food coloring and beat on high until light and fluffy. Spread the frosting over the cooled cookie bars in an even layer. 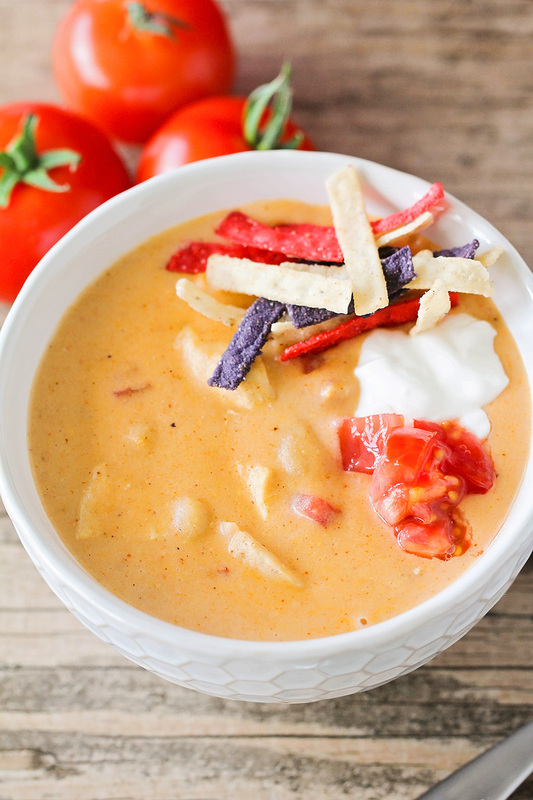 This savory and cheesy chicken enchilada soup is incredibly flavorful and easy to make too! Since moving to Portland, I have been absolutely overwhelmed by the number of amazing restaurants here. 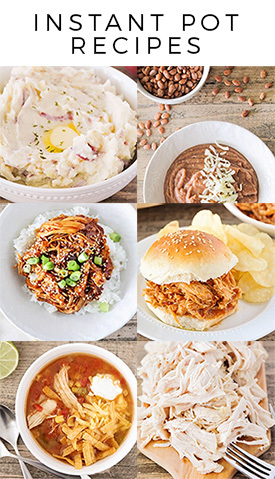 There are so many that it's pretty much impossible for me to try all of them, especially because I keep wanting to go back to the same three or four restaurants over and over. :) I love that there's such an emphasis on local, hand-crafted, sustainably sourced, high-quality food. It's awesome! And yet... sometimes I long for some of those chain restaurants we used to go to. Their food may not be the freshest or healthiest, but they're the places we went as dumb newlyweds. We have memories there. 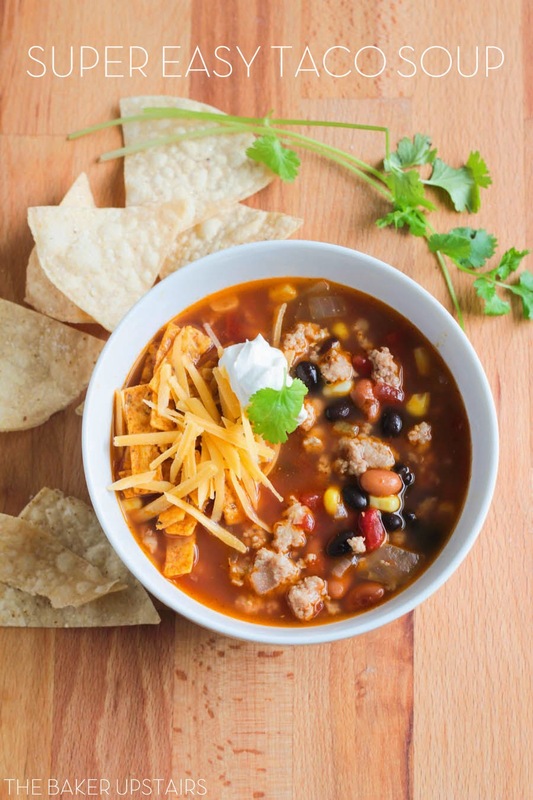 And sometimes, you just really REALLY need a bowl of Chili's chicken enchilada soup. Am I right? Since the nearest Chili's to me is something like six hours away, the only solution was to make it myself! 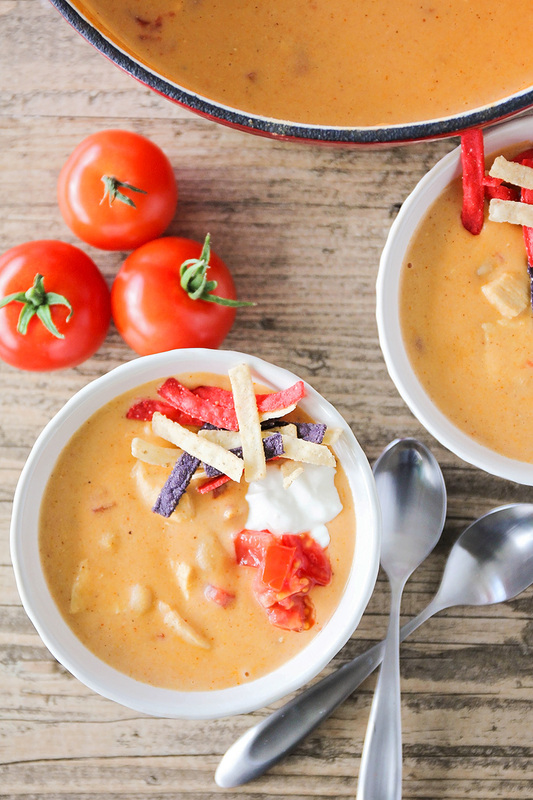 Full confession: this soup calls for Velveeta cheese. It's not something I regularly buy (in fact, I think this may be the first time in fourteen years of marriage? ), but I got a block of Velveeta free with a coupon from the grocery store recently, and it felt like fate. If you're not a Velveeta fan, I don't really know what to tell you. 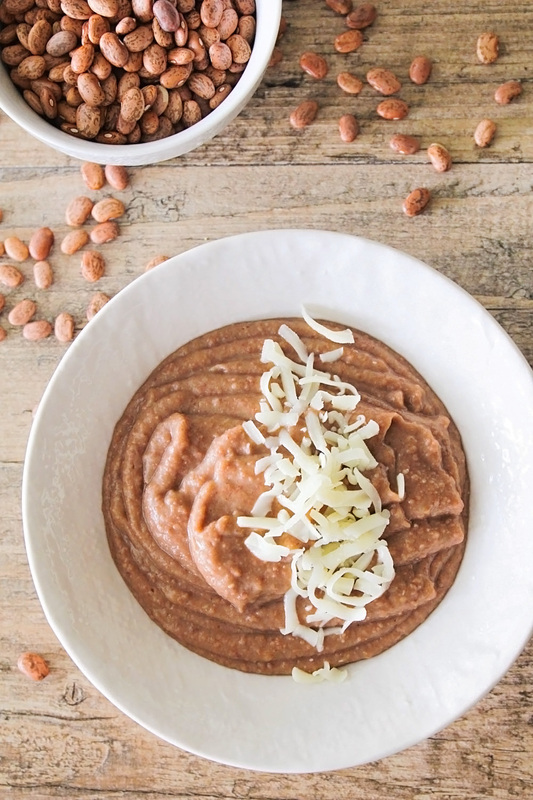 It's a pretty crucial ingredient for this soup, so you may want to just try a different recipe. All that being said, this soup is fantastic! 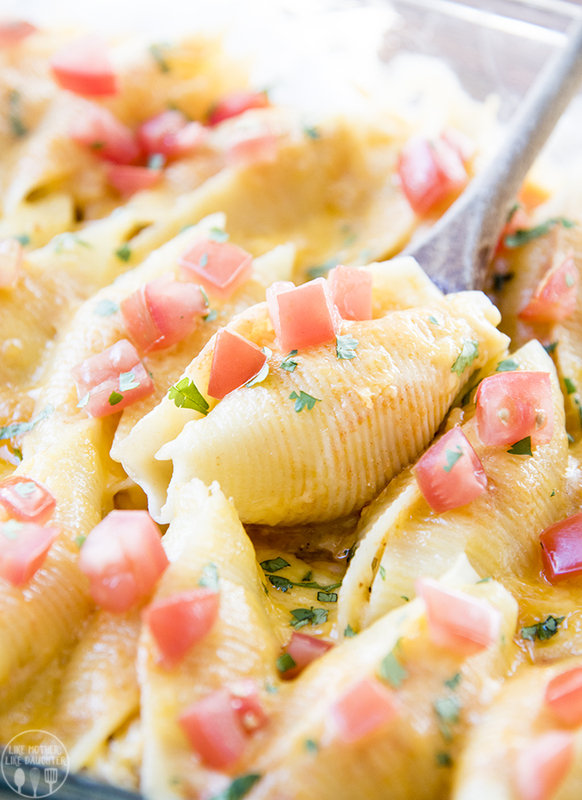 It's so creamy, cheesy, and smooth. I added some beans and diced tomatoes to give the soup a little more texture, and I loved it that way. 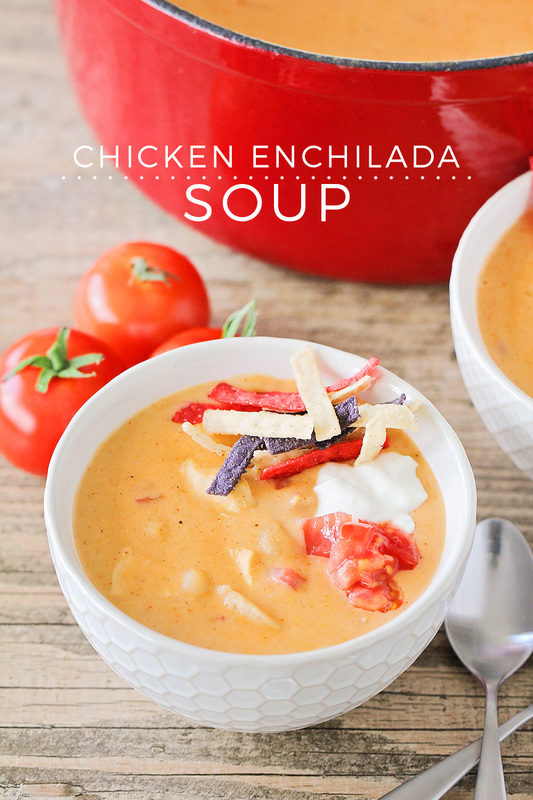 I topped mine with sour cream, diced tomatoes, and tortilla strips, and it tasted just like that Chili's soup I love. It's probably not the healthiest soup I've ever made, but it was perfect for satisfying my craving, and the whole family loved it! 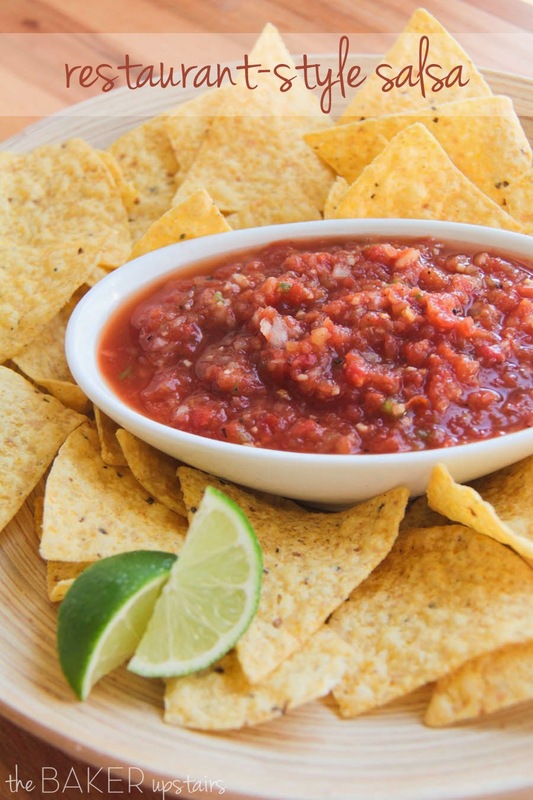 for serving: tortilla strips, sour cream, chopped tomatoes, grated cheese, etc. 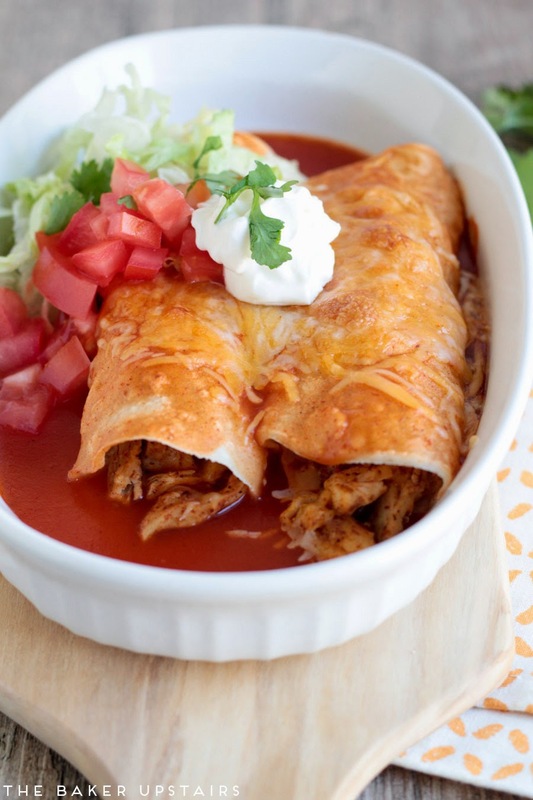 In a large pot, whisk together the chicken broth, enchilada sauce, masa marina, salt, garlic powder, chili powder, and cumin. Bring the mixture to a simmer over medium heat. Stir in the chicken, beans, tomatoes, and Velveeta. Cook 15-20 minutes, stirring frequently, until the Velveeta is completely melted and the soup is slightly thickened. 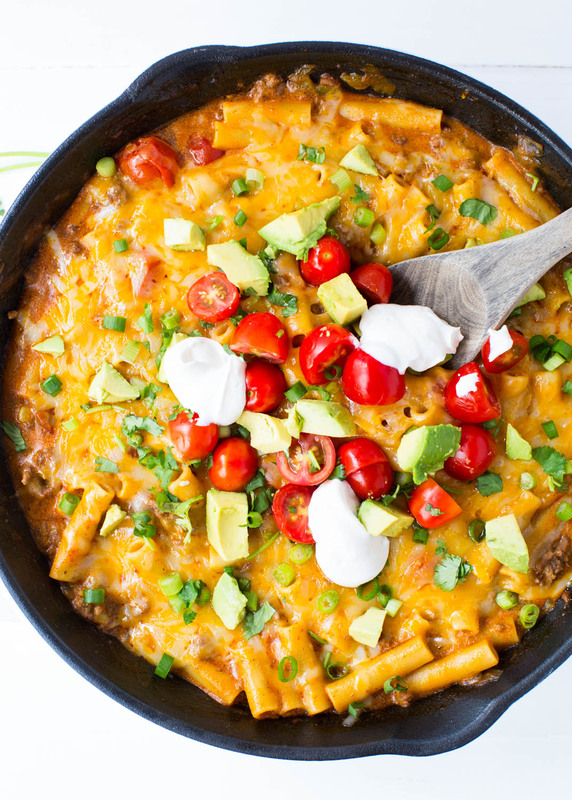 Serve hot topped with tortilla strips and sour cream. 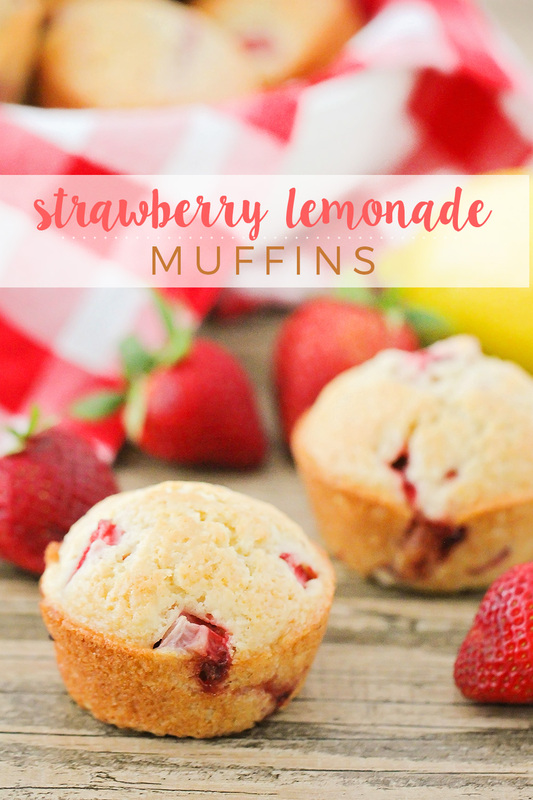 These strawberry lemonade muffins are so light and tender, and so flavorful too! 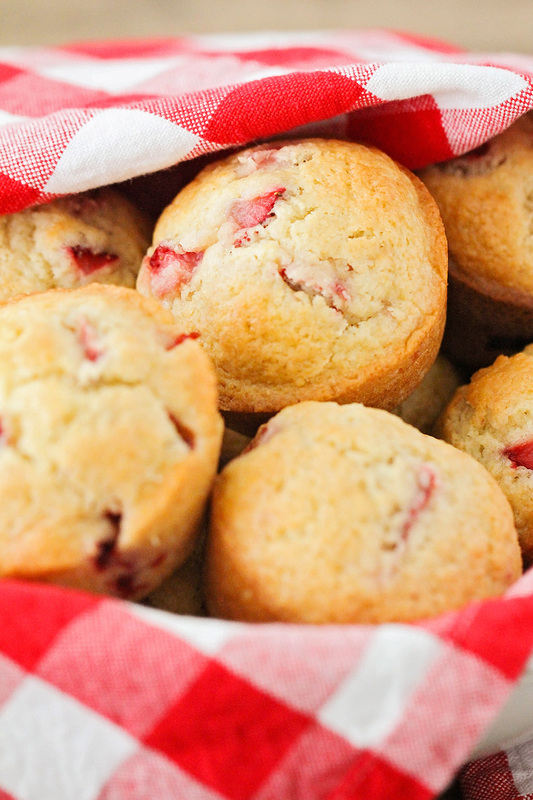 They're bursting with juicy strawberries, and perfect for breakfast or brunch! I heart muffins. So, so much! I kind of think that I expect too much from them, though... they have to have just the right texture, light and tender, but not too crumbly. I love it when they're bursting with fresh fruit, and I'm always up for interesting flavor combinations. 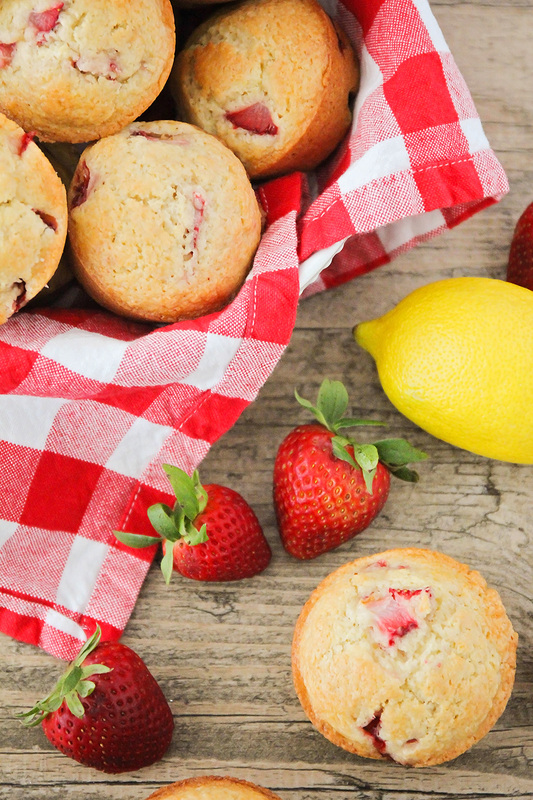 These strawberry lemonade muffins fulfill all of my requirements, and so much more! 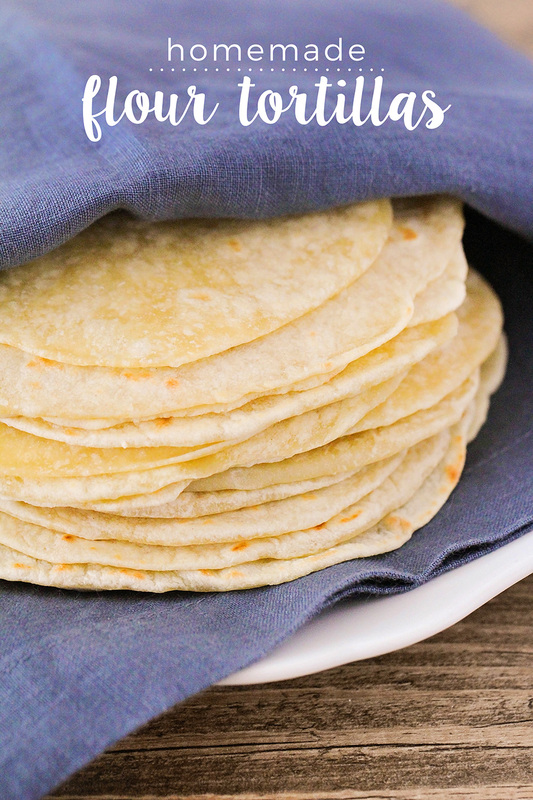 They are amazingly delicious, and have the perfect light texture. 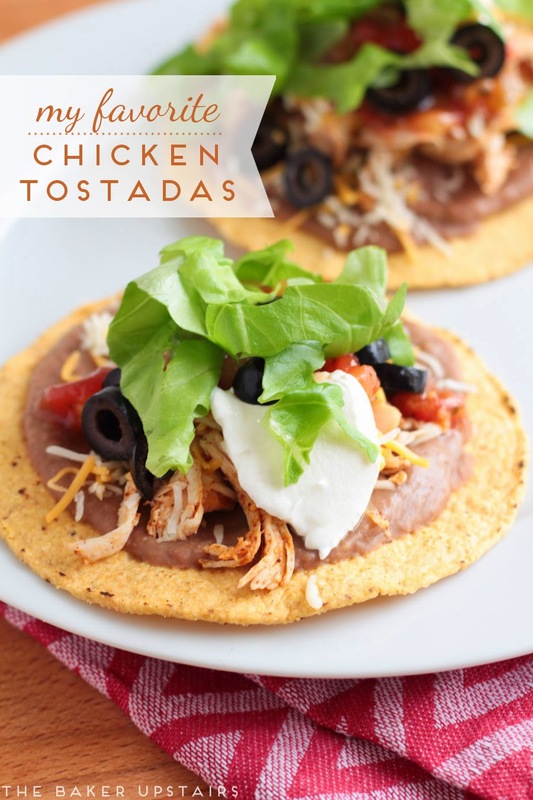 I made these as an after-school snack for the kiddos last week, and they basically just evaporated. They were so good that no one could get enough! I'm glad that spring is now upon us, and the strawberries are inexpensive and plentiful! I may have audibly squealed with delight when I found strawberries for $2.50/pound at Costco. They are definitely my favorite part of the warmer months, and we go through them like candy at our house. 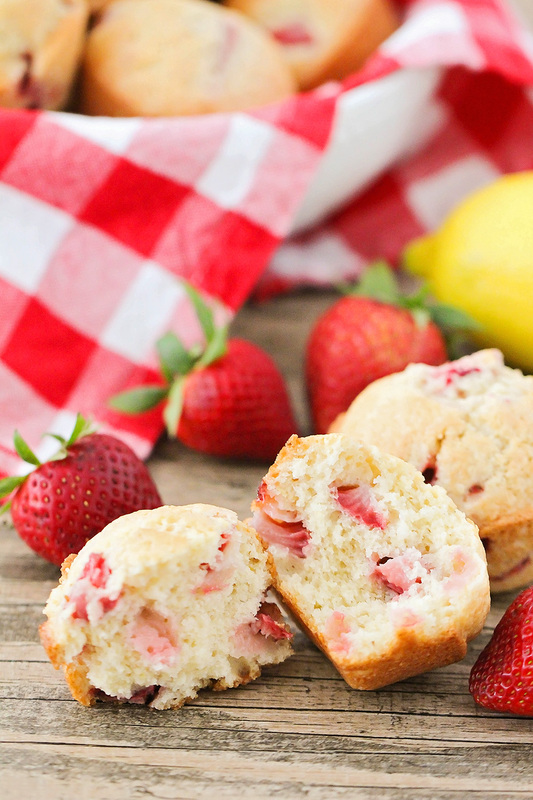 These strawberry lemonade muffins are definitely going to be on the menu all summer long! Preheat the oven to 400. Line a 12 cup muffin tin with paper liners or spray with cooking spray. In a large bowl, rub the lemon zest into the sugar until the mixture is fragrant. Add the flour, baking powder, and salt, and mix to combine. 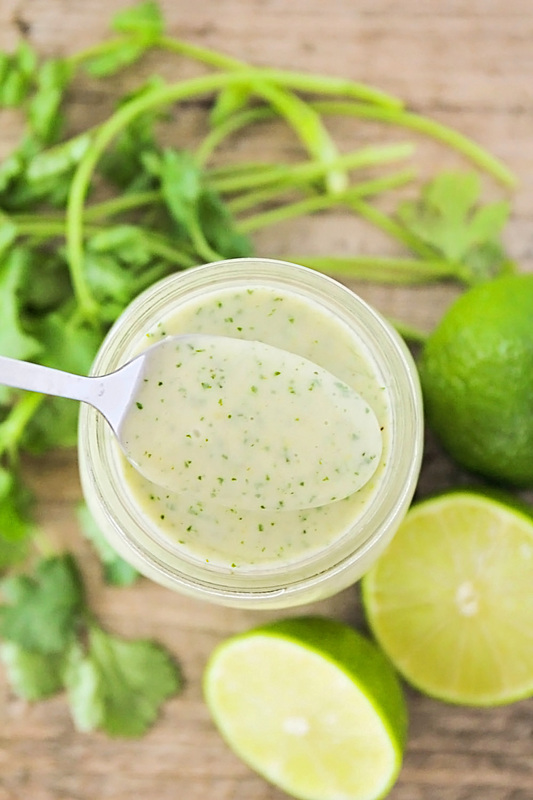 In a small bowl or measuring cup, whisk together the oil, egg, milk, vanilla, and lemon extract. Pour the wet ingredients into the dry ingredients and mix until just combined. Gently fold in the fresh strawberries. Scoop into the prepared muffin tin, filling 3/4 full. Bake 15-20 minutes, or until golden brown.